viewmyblog.com: When will North Korea join the World? 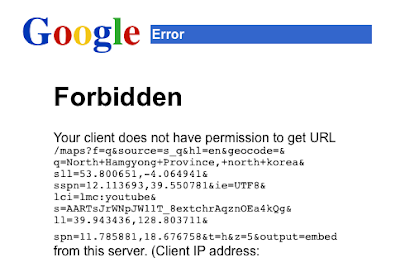 UPDATE: 19th March '09... Google blocked the google map i had previously of the reported Launching Ground in Hwadae County, North Hamgyong Province ? ! So I've removed the map and took a screen shot of what showed. Radio and TV sets in North Korea are pre-tuned to government stations that pump out a steady stream of propaganda. The state has been dubbed the world's worst violator of press freedom by the media rights body Reporters Without Frontiers. North Korea has a minimal presence on the internet. The web pages of North Korea's official news agency, KCNA ( www.kcna.co.jp ), are hosted by the agency's bureau in Japan. North Korea is now in preparation for launching 'an experimental communications satellite' Kwangmyongsong-2 at Tonghae Satellite Launching Ground in Hwadae County, North Hamgyong Province. I wish North Korean would join the World but beware, NK has zero press freedom and the 50 million living there no nothing of the World other that what they are told from their national news agency.